When visiting music.google.com from your Android device last night, you were presented with the above image. 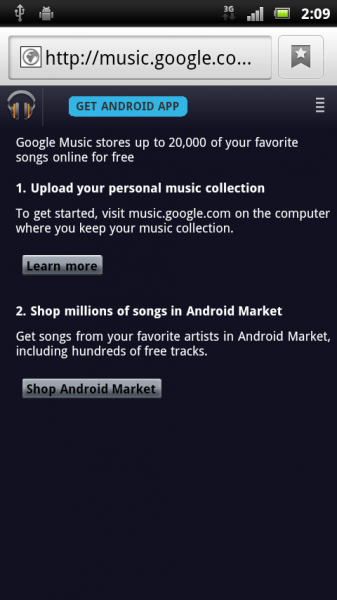 Reports have been circulating that Google is looking to launch their own music store within the coming weeks. When the page above launched, the “Learn More” and “Shop Android Market” links were both unresponsive. However, the first link will now lead you to Google’s introduction page for Music Manager, and the second has since been removed. It seems as if we found something before Google intended it to be found. When ever I am listening to music on my device, and I am not on Pandora, I am using Google Music. While I can’t store all of my songs, I am fine with having 20,000 accessible anywhere. It will be interesting to see how Google will price various songs and how well they compete against Amazon and Apple. Contest Reminder: Win a Sony Tablet S, Jambox and $25 Gift Card Today from NVIDIA!